For those of you who don’t know, my wife and I are proud parents of two amazing little boys. Our first son was born in Chicago at 28 weeks, a full three months early. We have been very fortunate in the way things have turned out, but others who have premature babies often struggle with lifelong side effects. As a family, we support The March of Dimes and will be taking part in the walk in Houston on April 29th, one of many fund raising walks around the country. Get involved in a great cause. Below is a post I wrote for the Better Husbands and Fathers blog telling a little about our story. I’m happy to report our son is doing very well and looks quite good in glasses. 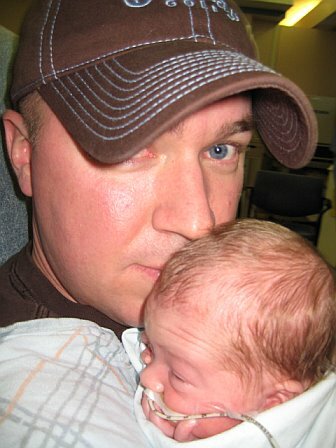 Today’s featured Preemie Dad is Marc Mapes. You can follow him on twitter @marcmapes and he blogs here. As you will read Marc is the father of a premature son – a 28 weeker! Marc and I have similar stories, in fact, both of our wives are pregnant again and are about 30 weeks along – Congratulations to Marc and his wife for a more successful pregnancy this time around and good luck the rest of the way! November 4, 2007. The day my wife was due to deliver our first baby. Unfortunately, he had other ideas. Due to circumstances that were never fully discovered, our son Barrett was born on August 13th at 28 weeks and two days, He weighed an impossibly small two pounds and seven ounces, but as the doctor put it “he came into the world screaming and peeing” – which apparently is a good sign. Prior to the day of delivery, my wife had been in the hospital for almost a week and the doctors used every technique known to modern medicine to prevent the pre-term birth. Looking back now, I hope I never feel more helpless than I did that week, and especially that day. To add to the drama, other circumstances made it necessary for the birth to be performed as a crash c-section so I wasn’t able to be in the room. The first time I saw my son he was being wheeled past me in a plastic bubble with multi-colored tubes and wires everywhere. Not exactly the way we all plan seeing our children for the first time. Barrett spent 10 weeks in the NICU. That period can best be described as a roller coaster ride of emotion (for us) and physical setbacks and incremental improvements (for him). I will never forget the sound the monitors made when his heart rate would fall below the acceptable level, the “kangaroo” sessions, the tube feedings and the look on my wife’s face every night we got in our car to go home without our son. The doctor’s original long-term prognosis was pretty devastating, but he continued to steadily improve. Luckily, we lived very close to the NICU so I was able to stop and see him every morning before work and we would spend every evening there with other parents and nurses instead of in our home learning how to be a family in private. Our son is now three, and with the exception of having to wear glasses due to his retinopathy of prematurity, he shows no signs of coming into the world 3 months early. I have no way of knowing if our experience during this time has made me a better father, but it has made me appreciate the delicate miracle of life and the importance of family. I’m happy to also report that as I write this my wife is over 30 weeks along with our second baby, so it appears the circumstances causing our son’s prematurity will always remain one of life’s great mysteries. ← TalentNet Live Dallas. My overall takeaway: authenticity is key.